We’ve done it!! And, it didn’t take us too long to figure it out. Sometimes 2 brains are better than one. 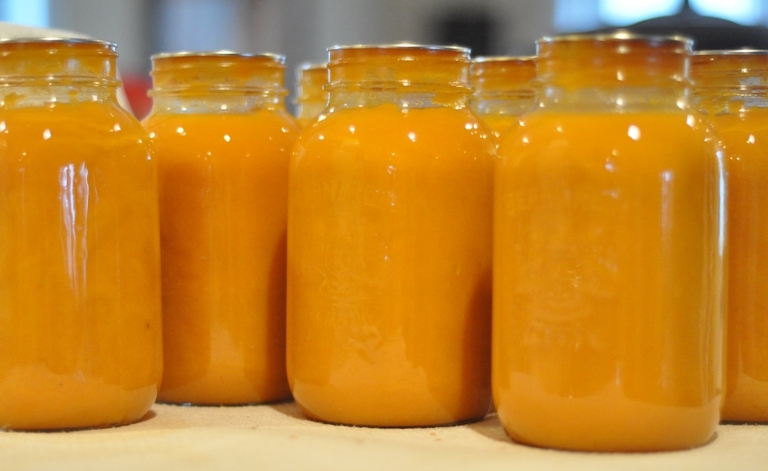 Our 3rd batch of soup ~ carrot soup ~ sealed completely…all seven jars. I decided to read (again) the pressure canning manual that came with our pressure canner from start to finish to see if I could figure out what we were doing wrong. Surely, we’re missing something…afterall, lots of people pressure can soup, veggies, and fruit so why were we having such difficulty!?! Well, as you may or may not know all pressure canners are a little bit different and you must make sure that you follow the instructions/guidelines for your model of canner. Here is what we decided…We were not leaving our jars in the canner long enough after the gauge went back to zero. The instructions in our manual indicate that once the gauge registers zero the Pressure Regulator Weight can be removed and then the cooker may be opened safely. This is what we did the first time and there was a massive surge of liquid that came out of the jars. Clearly, the jars had not cooled down sufficiently. So, we decided to wait a little bit longer with the second batch of soup. In fact, it took almost 30 minutes for the gauge to resister zero and then we waited a bit longer before removing the Regulator Weight. The guidelines expressed by the National Center for Home Food Preservation are also helpful in explaining the reasoning behind many of the instructions and guidelines necessary to practice safe home food preservation. Their guide also states, “after the canner is completely depressurized, remove the weight from the vent port or open the petcock. Wait 10 minutes; then unfasten the lid and remove it carefully. Lift the lid with the underside away from you so that the steam coming out of the canner does not burn your face.” Ten more minutes can make all the difference from half of your jars sealing to all of them sealing. Okay, so I need to work on patience…who doesn’t? On with “operation soup”. We picked up a 50lb bag of the largest carrots ever for $18.50 from our local veggie shop. Carrot soup is the soup of the day maybe even the soup of the week. This recipe comes from New England Soup Factory Cookbook by Marjorie Druker and Clara Silverstein. If you are looking for a great Christmas gift, for that special cook in your life, then this soup making book is it…look no further. All of the recipes we’ve tried in this book are GRRReat!!! less than 1/2 cup of heavy cream per 1 litre (1 quart) jar. Note: this is to be added when reheating to serve. DO NOT add the cream to the soup that will be pressure canned. In a large, stainless steel stockpot over medium-high heat, melt the butter. 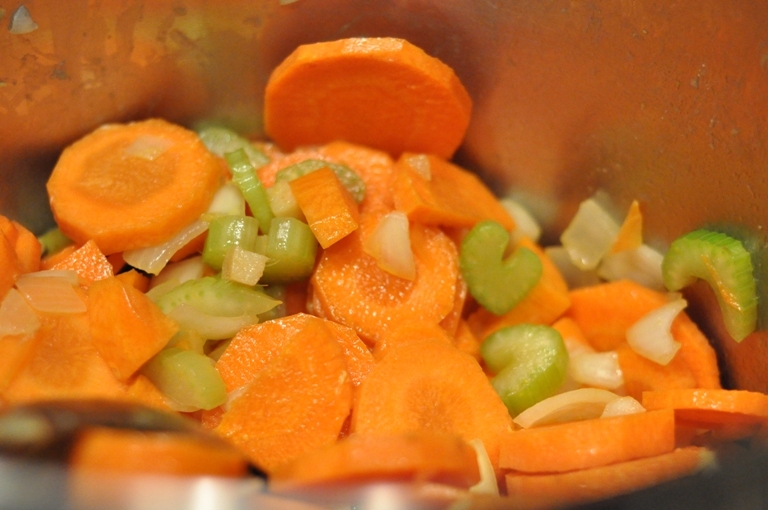 Place the garlic, onion, celery, carrots, and ginger root in the pot and sauté for 10 minutes, stirring frequently. Add the stock to the vegetables and bring to a boil. 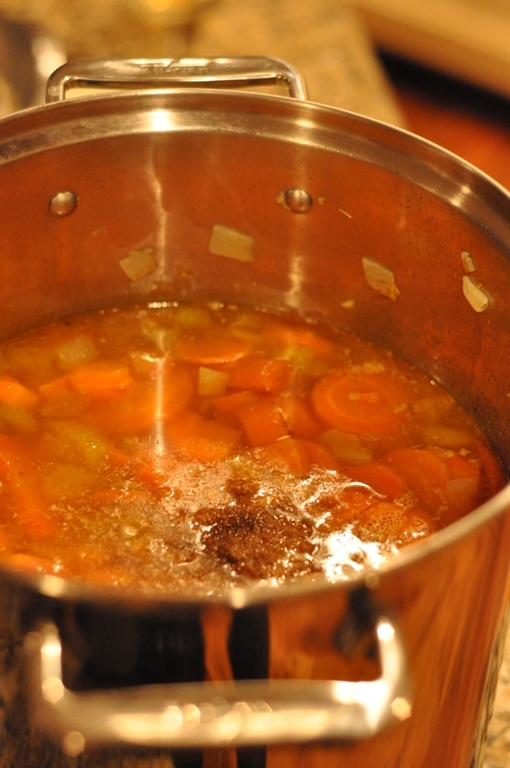 Reduce heat to a lively simmer and cook until the carrots are tender, approximately 30 to 35 minutes. Remove from the heat. Add the coriander, ground ginger, and honey. 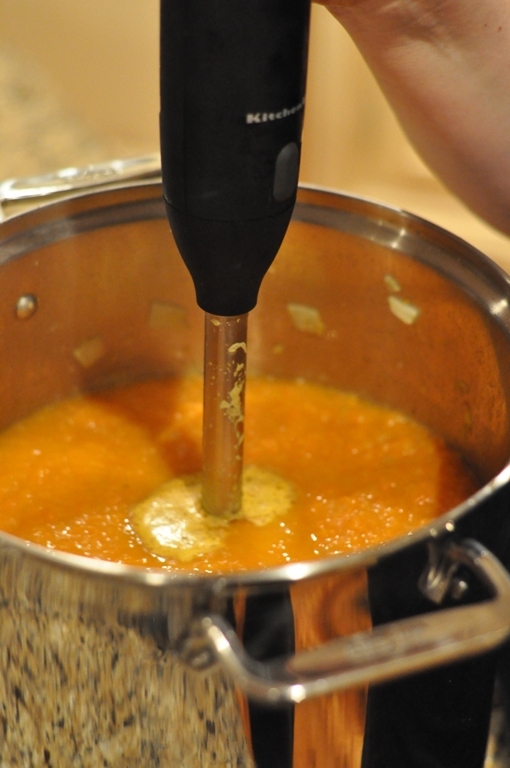 Purée the soup in the pot using an immersion blender or working in batches with a regular blender until smooth. 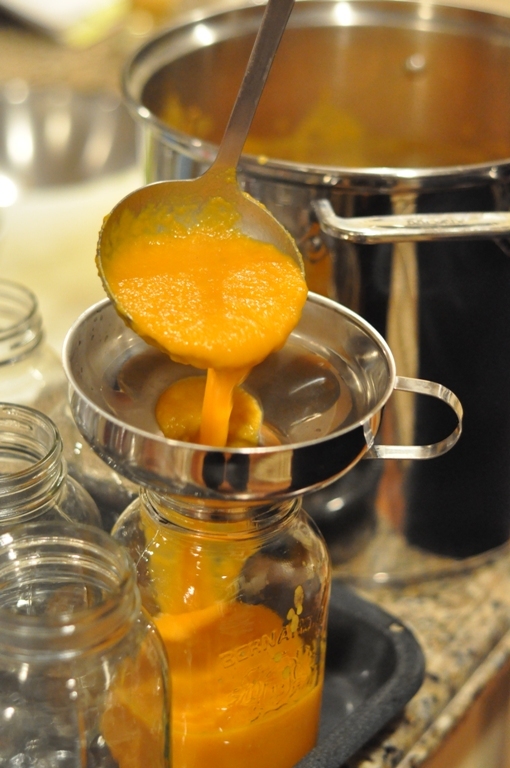 Ladle the hot soup into the sterilized jars, leaving 1″ headspace at the top. Note: sterilizing the jars is not necessary but we’ve gotten into the habit of doing it and this way your jars are extra clean and nice and hot too.) Use a damp paper towel to wipe the rims of the jars, then put a flat lid and ring on each jar, adjusting the ring so that it’s just finger-tight. Place the jars in the pressure canner and follow the pressure canning directions for your area. Our pressure canning guide indicates that 1 litre or quart jars of vegetable soup should be processed for 85 minutes but the National Centre for Home Food Preservation says 75 minutes. Please use your own judgement. 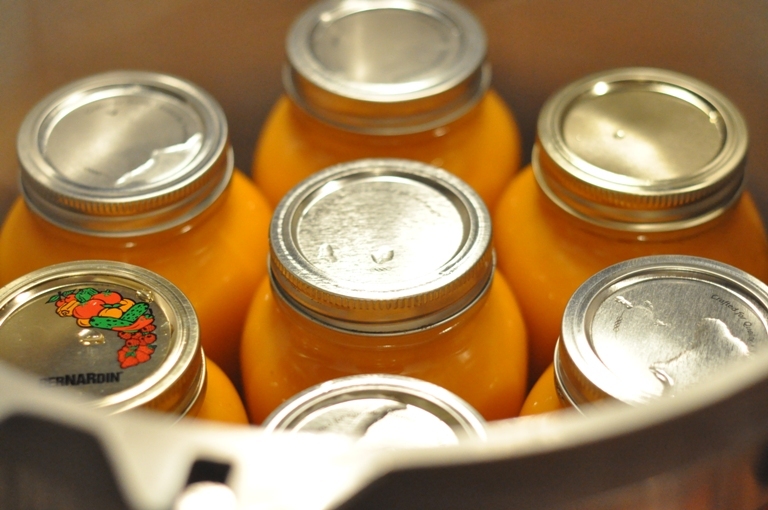 Leave the jars in the pressure canner to cool to zero pounds of pressure. This may take 30-40 minutes maybe longer. Remove the Regulator Weight or petcock and wait 10 more minutes. The jars can be safely removed at this point. Wait 12-24 hours check seals, label and store. If you have jars that do not seal be sure to put them in the refrigerator and eat the contents within a couple of days. When reheating a jar to serve add a little bit less that 1/2 a cup of heavy cream to each 1 litre jar. Stir until the ingredients are well combined, season to taste, and serve. It’s as simple as that! This soup does not take long to prepare or cook. It has a great flavour and I think could be served without the added cream…maybe cut back on the ginger (just a little). For those newbie pressure canners (like me) I think this is a great soup recipe to start with. The ingredients are simple and the prep and cooking time relatively short but you would never know how easy it was after just one tasty spoonful. It’s delicious and a beautiful glowing orange. Enjoy!! Please note that we doubled the above recipe to make just a little bit more than 7 x 1 litre jars which is the perfect amount to fit in our pressure canner. Oooh, Carrot Ginger soup! Sounds delicious. This soup is so beautiful! I really like your funnel, by the way. Where did you get it? Thanks…we were really pleased with how this soup turned out. We had the Tuscan Minestrone for lunch and it was really tasty…so, for now, it is a toss up. We are planning to make more soups this weekend so I’ll keep adding our recipes etc… These soups can also be made fresh and refrigerated. This funnel has a smaller part that attaches and detaches (quite nicely) to make the mouth of it smaller or wider…perfect for canning. Yay for you for figuring it out! That soup is beautiful! I would love to have some jars of it lined up in my pantry. It is not the time you let the pressure canner rest. It is how tight you make the rings in the jars. 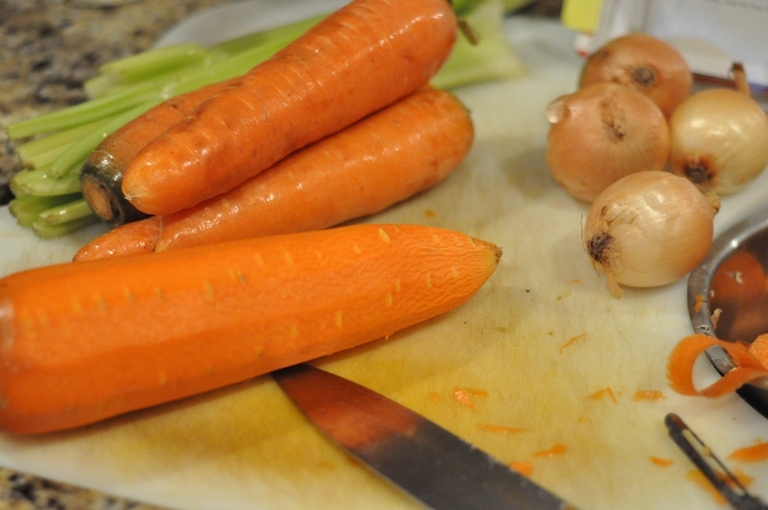 In my experience, the rings have to be tight so they do not boil over…..Just made your carrot soup tonight…..all 8 pints sealed. I added more ginger, and used white pepper, and local honey…….but the pot tasted good…..hope the canned product tastes just as good. You might consider using Sea Salt instead of Kosher. Less sodium, and better for you (if you are not Jewish). I used homemade vegetable stock to allow my Vegie friends to eat it. It would probably be even better if I used my Turkey or Venison stock. I can in pints because I hate wasting extra soup/stock. You can always use 2 if you have to. The Garlic, onion, carrots were all from my garden I tried growing ginger root but it died. If you don’t know……add a little White Vinegar to the water of the pressure cooker…..it will keep the calcium deposits off your jars. Thanks for your blog…..I really like the recipes. I will suggest one other thing…….think about using white pepper…..a much better taste. You say not to process the soup with the cream. Will it affect the safety of the soup? I have used coconut milk (not dairy) in a squash soup. It seems that after canning there was a thin harden layer on top of the soup and the soup had thickened. I ate the soup and it was delicious! Is the coconut milk affecting the safety and/or shelf life of the product? Or is it just affecting the looks of it? Thanks for your feedback. According to the National Center for Home Food Preservation cream or other thickening agents should NOT added to the soup. Well, they do not explain WHY…I’m assuming that it is because the dairy makes it much more difficult to reach and maintain temperatures required for the soup to safely be preserved…(perhaps similiar to pumpkins). 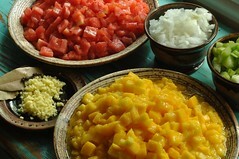 We tend to air on the side of caution when preserving our own food….so I would just add it when serving. Friends of ours have added the cream or dairy to their soups going in the pressure canner and have found that the soup goes lumpy but once re-heated to serve they are able to wisk the soup back to a nice smooth consistency. However, they now just add the milk/cream when re-heating to serve. Does this help? I have another question: I cannot find anywhere a recipe that cooks throughly chick peas or pinto beans before pressure canning. The recipes always require around 90 min. for a quart. If my beans have cooked for already 90 min or more why do I need to pressure can them for another 90 min.? Would an hour be enough for a good vaccum seal and sterelization of the food and jar? Same question for your carrot soup above. Would it be enough to process it for less than 75 min.? It sounds that we are overkilling it… Thank you for your feedback. I am not really sure what your first question is but I will try. When preparing soups for pressure canning you need to hydrate the beans and then cook them in the soup before pressure canning. I agree that it does seem like overkill to pressure can soups for 75-90 minutes but I would much rather follow these practiced methods outlined by the National Center for Home Food Safety to be sure that we are killing an potentially dangerous elements…like botulism. You have to use your best judgement. We’ve tried to educate ourselves as much as possible by reading reliable material and discussing practiced methods with other canners. I’ve concluded that pressure canning soup is a great way to put up a glut of locally grown, inexpensive veggies but it is not something I would purchase food to do. I think making soup at the time is just as easy and does taste better. Let me know if this helps or if you have any other questions. This looks like a perfect recipe for what I had in mind. Thanks. I do have a question though- I had learned not to put butter or oil into soups for canning- are you sure it’s safe to use butter for sauteeing the onions and garlic, etc.? Thanks in advance. We think it’s fine to use butter to sauté your veggies but we’d never ask anyone to substitute our judgment for their own…the National Centre for Home Preservation states the following about pressure canning soup…”Do not add noodles or other pasta, rice, flour, cream, milk or other thickening agents to home canned soups. If dried beans or peas are used, they must be fully rehydrated first.” But, there is no mention about butter. I’ve read conflicting advice about the safety of canning pureed soup – instructions seem to specify half “chunks”, half broth. Any thoughts on this? That is a very good question. This year was the first year that we pressure canned soup or veggies and to be honest it was quite the learning curve…in fact, we are still learning. The National Center for Home Food Preservation addresses this question well in Heat Processing of Home canned Foods. We would strongly recommend reading all of this information before deciding how you are going to process your food items safely, what method of processing to use (hot water bath or pressure canner) and for how long. If you scroll to the bottom you will discover that they DO NOT recommend puréeing or mashing the veggies before pressure canning and that the correct method would be as you mention half “chunks” and half broth. However, this being said, we have pressure canned our pureed soups and are still alive to write about it. We are comfortable with our methods, the cleanliness of our kitchen, the length of time we pressure can our soups for and in general our canning practices. We DO NOT ask anyone to substitute our judgment for their own and think that everyone needs to determine their level of comfort with this matter. I’ve been having the debate in my head about whether to try canning pureed soups or not, this is my first year canning all together, and I’ve just received a pressure canner (Anniversary present, whoever gets upset when they receive kitchenware as gifts is crazy in my book!) and would like to start by putting up a few soups. At the beginning of your reply you state that this is the first year you’ve pressure canned purees, but then go on to say later that you are still alive to write about it. I’m not sure if I’ve read that wrong, or if my timeline is off. How long was it between the canning and the actual consumption? I subscribe through google reader and this post just showed up a week or two ago (Oct 2011)… Judging by the time stamps on this page though, it was a post from a long time ago. This may be the problem. Love your site and your soup! Beautiful. Thanks for the post and the info, great read! I have a question, is there any way to keep siphoning at bay? I get some of this and it can be with veggies and soup. I have a Presto pressure canner and I never have problems with sealing the jars. What I do is when the time is complete, I remove from the hot burner and take off the weighted gauge and then when it reaches 0, I take the jars out. Is that okay? Thanks for all your help! Keep the soups coming and the stews! We need to store for winter! Thanks! Thanks for all of your comments…we love to hear about what others are making! We are just getting ready to tackle our soups for the year…so much wonderful produce to put up right now. We have a glut of tomatillos and are thinking of making some tomatillo chicken soup (afterall, there is only so much salsa one family needs and I think we’ve already exceeded it). We’ve also had some problems with siphoning (both with water bath canning and the pressure canner). Here would be our recommendations and what we’ve found works to almost entirely eliminate the problem. SLOW COOLING TIME. With the pressure canning ~ we think you would have less siphoning if (1) once the required time is up to turn off the heat and allow the pressure canner to cool down more gradually until the steam gauge drops to zero. (2) Then, once the gauge drops to zero remove the weighted gauge slowly. (3) Do not release steam pressure too quickly because this will cause siphoning. We remove the gauge and unscrew the lid once it has reached zero (it is also important to remove the pressure gauge and lid quickly after it has reached zero because a vacuum seal can be created if you leave the gauge on too long making it almost impossible to remove the lid ~ we know because we’ve done this too!). Cooling to zero sometimes takes 30+ minutes. This is somewhat of a pain especially we you want to get another batch going but it has almost completely eliminated our siphoning problem. Water bath canning solutions can be found in this post ~ Siphoning 101. We really hope this helps…patience is the real solution! You’re right; it doesn’t need the added cream & less fat that way. Also, I used olive oil instead of butter in case my vegan friend wants to try it. I realised after I started cooking it that I don’t have any coriander in the house, but it doesn’t seem to be an issue that I left it out. It’s still very yummy! A lot of our posts were just recently updated as we enlarged photos and added more links…so the timeline is off. We did a lot of pressure canning last year and consumed over 120 liters of our homemade soup over the course of the year. Many of our soups were pureed but we would advise you to read all of the information presented by The National Center for Home Preservation and determine how you would like to proceed. We simply post our process and do not expect anyone to substitute our judgment for their own. Making soup and pressure canning it is something we plan to do a lot more of as all our soup was delicious. It took several weekends to put up all the soup and it seemed like tons of work at the time but being able to crack open and enjoy a jar every day made it so worth while. We highly recommend it! The Tuscan Minestrone was one of my favorites and we plan to make it again this fall. Hope this helps. if you have any other questions please don’t hesitate…getting the hang of the pressure canner took up a few tries but once you figure it out you’ll really like it! I am confused.. I would love to pressure can zucchini pureed soup. There are web sites giving direction for this, but advice from several sources say it is not safe to pressure can pureed soups, however bbb recipe for bean soup says to puree it.. this is much denser than the pureed zucchini. Do you have an answer to this. Your tuscan minestroni is great. Please reply. I address this question a in another reply (Feb 7th). I can only suggest you read the National Center for Home Preservation guide and decide how you wish to proceed. The issue is whether or not the pureed soup is too thick to allow the heat to properly penetrate through the center of the jar for the amount of time required to kill harmful toxins. I am going to start pressure canning meat and soups. Why can u add butter to the recipe but not the cream? What happens if you put cream in a jar to can?? Pressure canned soups are amazing. We are still trying to find the time to do ours…hopefully soon. Great receipes Going to try the carrot soup. I have been reading about this issue all day today. There seem to be a lot of problems with the language and knowledge of various canners out there. This is my list of things that don’t make sense and things that are still questions. 1. Density of product to be canned. Cream may be thicker than broth but I pressure can my own meaty tomato sauce. It has fat in it. It is pretty thick. Yet despite those conditions it is considered completely safe to can. I also can fatty meats and tuna in oil! This is still considered safe. No doubt logical people have problems with rules that don’t explain themselves and where you can find examples of safe to can foods that have similar problems but that don’t have to conform to said rules. That said I am paying a lot of attention to actual thickness of everything I can and making judgement calls all the time as to whether something the NCHFP considers safe is not so safe. 2. Botulism, can be in/on foods that grow in the ground. Attention to cleanliness is very important, but can’t be relied on totally when it comes to botulism spores. Just saying. 3. Some good workarounds for cream soups etc. would be to make a chunky broth let’s say for carrot soup. Pressure can that and add the creamy stuff in when you cook it up. This is a great workaround. However, I am looking for a solution for adding all the ingredients for a complete soup, because I feed people who don’t keep items like cream or coconut milk in their larder. If I give them soup it needs to be as complete as it can be. As far as cream curdling what I know is that cream can be boiled because it doesn’t curdle. (all bets are off if you add acid to cream tho) Milk or half and half runs the risk of curdling but not cream. Will cream curdle being cooked at 240 degrees in the canner is the real question? My opinion of many of the rules regarding canning safety is that they are basically a process of looking logically at the ingredients and the known safety of canning them in some combinations. Then if a new ingredient is to be added, I figure that it may not now be regarded as safe to can, but that could be in the future because the NCHFP hasn’t had the time/budget to test these recipes yet. It may do so at some time and then viola! it will be considered safe. After all ingredients like coconut milk are not that widely used in cooking yet, much less in canning. Finally, I have adopted the habit of canning foods of questionable thickness very hot in hot jars held in my pressure canner on the boiling until the canner is full. This is to make sure all the food is boiling hot to start. This is not a perfect way to safety but it does give me some peace of mind as I continue to research canning methods, times, temps, and ingredients. Are the measurements in this recipe single or have they been doubled as written already? Using your “timing” method, I used my brand new pressure canner for the first time with 100% sealing success! Fabulous!!! Love to hear of 100% success which makes all the hard work so worthwhile. to the heat used in the canning process. ) with small spatula, carefully remove any air bubbles between vegetables and jar. temperature and timing required for the specific recipe.